This is it. 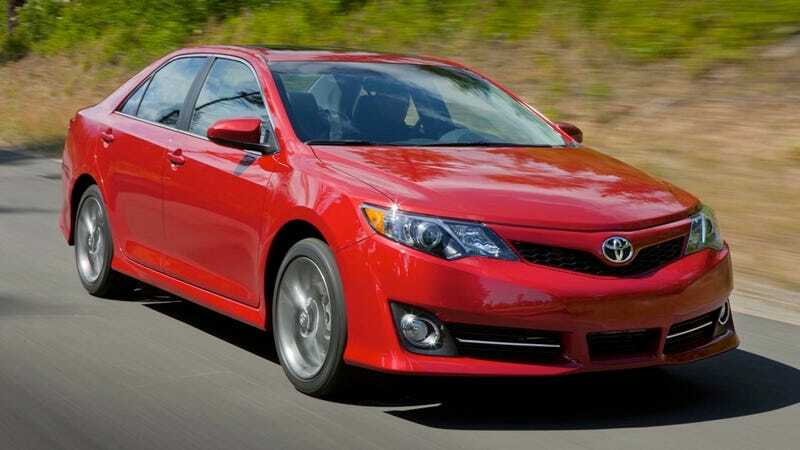 The newly-redesigned 2012 Toyota Camry. And yes, even in red, it's still just as beige as you'd expect it to be. The Toyota Camry has been the bestselling car (if we pull pickup trucks out of the list) and third-bestselling vehicle (if we leave pickup trucks in), in 13 of the last 14 years. Toyota's sold 15 million of the beige little buggers in over 100 countries, with 9.7 million of them in the U.S. alone. And even though the current model is long in the tooth, it still unintentionally managed to accelerate itself into the hands of 14.3% of all midsize car sales so far this year. So, you know, it's kind of an important vehicle for the super number one best automaker from the land of the rising sun. But although those numbers seem impressive, they're actually down — significantly — from 20.1% of all midsize sales in 2009 and 17.2% of midsize sales in 2010. Partly it's been from better competition from domestic automakers and Hyundai. Partly it was due to unintended acceleration. Partly it was due to the tsunami and earthquake. But we also can't help but think it's because it's so beige it's actually the standard bearer for appliance transportation. Let's be clear, this is not an enthusiast car. It never has been. Nor has Toyota ever believed it is. But maybe it needs to become one if they're to retain that crown — especially with strong competition already here from the Ford Fusion and the Hyundai Sonata. Frankly, I'm not sure just changing the sheet metal and adding a few additional options will be enough to help claw its way back to the top of the midsize heap. Although dropping the price point below the current model will probably help. So, likely, will Entune, Toyota's new infotainment system. You know, for the kids. Still, I feel like Toyota needs to do something exciting and different. This is not it. If you still want more details on the 2012 Camry — go here.